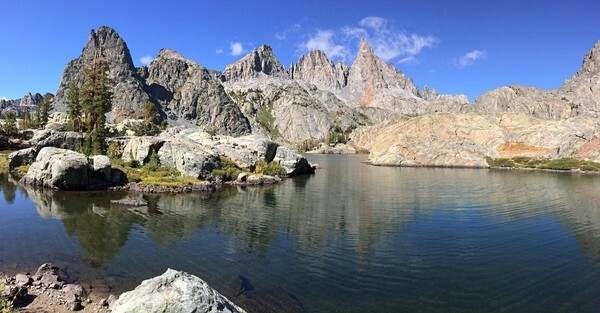 The Minarets are a spectacular collection of jagged spires in the Ritter Range of the Ansel Adams Wilderness. Usually I like to spread my adventures throughout the High Sierra since there are so many hidden gems to explore and mix up the character of scenery, but I have a particular affinity for the Minarets with repeated visits including July 2009 (Clyde Minaret), July 2013 (Minaret Loop), October 2013 (Tuolumne to Devils via Minarets), and July 2015 (Ansel Adams Loops). There are seventeen unofficially named spires and most are along a single ridge forming an arête. I have only climbed one Minaret, Clyde Minaret, which is the highest and named after Sierra climbing pioneer and legend Norman Clyde. Hopefully I’ll be able to tag a few more spires in the future. While I haven’t stood atop many of them, I have seen them from all different angles and I can’t seem to get enough of the spectacular ruggedness of these spires and the trio of three gorgeous lakes immediately beneath them – Minaret Lake, Cecile Lake and Iceberg Lake. While I’m merely an amateur photographer with a lot to learn, attempting to take quality photos is a big part of my personal enjoyment in the mountains. I use the word quality because some trail runners have a tendency to focus more on their watch and braggadocio than the scenery resulting in mediocre photography results at best and at worst, video that is so shaky and random in movement that it is essentially unwatchable. This approach couldn’t be more opposite than the ethos of John Muir. 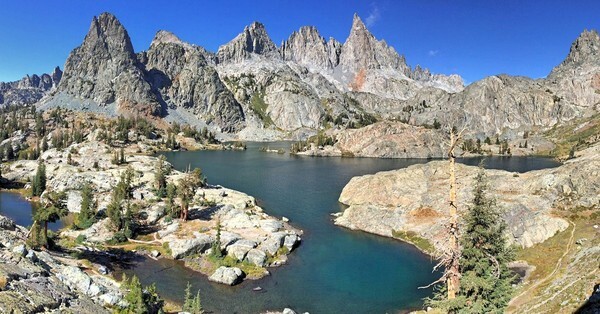 Whether it’s the Minarets or other photogenic gems in the Sierra, I always find it worth the time to scope out the best angles and enjoy the scenery. Each time I have visited the Minarets it has featured different light, snow conditions etc. so it’s fun to compare the results. On this trip, I had the best conditions I’ve seen yet at Minaret Lake with excellent clarity and a few puffs of clouds swirling about the spires. 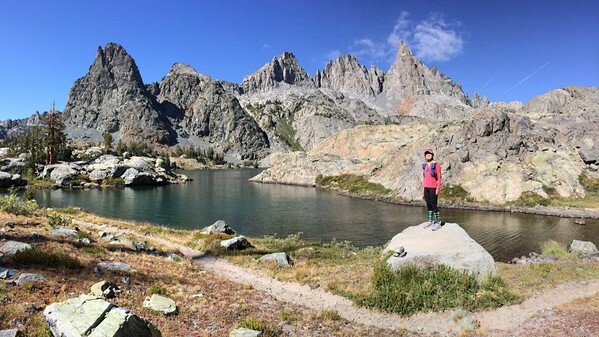 My photography tip at Minaret Lake is to climb a granite outcropping near the outlet of the lake, which provides amazing composition of the entire lake and a turquoise inlet below with the Minaret spires towering behind. This balcony provided such a great view I probably took a hundred photos within a span of 15 minutes (I’ve spared this blog from most of those photos but there are still plenty). It’s one of my favorite vantages in all of the Sierra. It was great to spend some time at Minaret Lake, Cecile Lake and Iceberg Lake and really enjoy the awesome surroundings. To complete the loop I recommend the River Trail instead of the JMT through Rosalie Lake. Both routes are very boring compared to the preceding section beneath the Minarets, but I like the River Trail better as it had less elevation gain and some nice peaceful single track in the forest next to the river that gets surprisingly little use. Strava GPS route here. Well said. And looks beautiful down there. Just looking at the skyline (and not the total relief) reminds of the pickets.